There is no shortage of opinions on the Gog, Magog war of Ezekiel 38 and 39 and various theories about the identities of the participants, but this page is an attempt to widen the scope of the story and gather some more perspective. The position of the Gog Magog war on the timeline is also complicated; it appears in both Ezekiel and Revelation but how do the two prophecies line up? Rather than just dwell on the excitement of the battle, read Ezekiel 35 to 39 and Revelation 16 to 20 straight through in order to get the context, from the regathering of Israel through invasion of Israel to the end of history as we know it; when the GOD of Israel steps in. Is this Gog Magog war the same as the Battle of Armageddon ? Time will tell. Ezekiel 35 - Against the neighbouring nations who sought to take advantage of Israel's punishment and take possession of their land. Ezekiel 36 - To the Mountains of Israel (Judea and Samaria - West Bank) - the enemy is boasting over you saying, "Ha! Even the ancient high places are ours now" - God says, "I am here for you" - "then you will be tilled and sown"
Ezekiel 37a - The Dry Bones vision - (so often taken out of context) - Israel resurrected from the death camps of the Shoah and returning to Eretz Israel. Ezekiel 40-42 - the new Temple in Yerushalayim and the Glory of God returns. We learn several things that are normally misunderstood, by including the earlier chapters . 1 This war will only occur after the Jews are gathered in from the lands of their exile. The phrase "from all the nations" did not apply to the Babylonian exile, where the Jews were taken to only one nation. 2 We notice that God will cleanse them once they are back, so it is not right to look critically at the Jews, expecting to be perfect before God brings them home. 4 The prophecy speaks of a people dwelling securely and unafraid, when they are invaded by the hordes seeking plunder. From one point of view this is not the situation today, with Israel threatened on all sides. But as Amir Tsafarti points out, the perspective from within Israel is different. The Israelis do feel secure and confident in the strength of the IDF and their advanced defensive technology. Also, Israel now has wealth that the horde from the north would like to plunder, since Israel has discovered vast fields of oil and gas, as well as becoming a powerhouse of technological innovation. We need to watch carefully to see which of the preliminary conditions have been met and which have not. Some things are "wait and see" and others are the subject of other prophecies - such as the end of Zechariah and the seven year covenant and the Tribulation in Revelation. Saudi Arabia (Sheba) is moving towards Israel due to the threat posed by Iran, and might therefore be seen as speaking up for Israel instead of joining the invasion. Note that the Ezekiel 38 invasion of Israel is not by the Islamic/Arab world and it is not over "Palestine"; the Arab world is losing sympathy for the Palestinian Authority. Revelation 16 - Gathering at Armageddon - after the sixth bowl of God's fury and before the seventh. Rev 16:13 And I saw three unclean spirits like frogs come out of the mouth of the dragon, and out of the mouth of the beast, and out of the mouth of the false prophet. For they are the spirits of devils, working miracles, which go forth unto the kings of the earth and of the whole world, to gather them to the battle of that great day of God Almighty. Notice 16:15 is a warning of Jesus' return (Messiah's coming) Behold, I come as a thief. Blessed is he that watcheth, and keepeth his garments, lest he walk naked, and they see his shame. Revelation 19:17 - Birds summoned to feast on the flesh of kings, the flesh of generals, the flesh of important men, the flesh of horses and their riders and the flesh of all kinds of people, free and slave, small and great!" This chronology suggests that the world's armies could assemble at Armageddon some time soon - and possibly move down (if the assumption that Armageddon is Har Meggido is correct) to Jerusalem - the valley of Jehosophat and then Jesus will return with Heaven's armies and defeat the world's armies before commencing his Millennial reign. It also appears that the war in which Gog and Magog are named will be the last war at the end of a thousand years. If that is the case, there is little point in dwelling too much on Gog and Magog today as they have over a thousand years to wait. However, some nations appear to be able to maintain a hatred of Israel for millennia. Some patterns of hostility may apply before Armageddon and again before the final war. Maybe the need for a hook in the jaw will be a result of reluctance to repeat the mistake of Armageddon. Whenever the preliminaries are completed, we note that God will put a hook in the jaw of a group of nations and bring them down against the land of Israel in the latter years. The allies that come with this northern invader are named by nation (tribe), and Bible scholars have traced the tribes and concluded that this northern army is led by tribes that have settled in Russia and the allied tribes are Islamic nations and are enemies of Israel. Magaog - Russia - Russia is straight north of Israel, all the way up to the Arctic Circle. From H1463; Magog, a son of Japheth; also a barbarous northern region: - Magog. Magog was a grandson of Noah and he and his descendants migrated north toward northern Asia and southeast Europe. Probably of foreign derivation; Tubal, a postdiluvian patriarch and his posterity: - Tubal. Of foreign origin; Paras (that is, Persia), an Eastern country, including its inhabitants: - Persia, Persians. Probably of foreign origin; Cush (or Ethiopia), the name of a son of Ham, and of his territory; also of an Israelite: - Chush, Cush, Ethiopia. Of foreign origin; Put, a son of Ham, also the name of his descendants or thier region, and of a Persian tribe: - Phut, Put.
? not in KJV ? Probably of foreign derivation; Togarmah, a son of Gomer and his posterity: - Togarmah. From the above it is clear that there are differences in interpretation of these place names. Different translations choose ancient or modern names. What is clear is that most of these nations aligned with Magog are currently militant Islamic states with an express hatred of Israel. 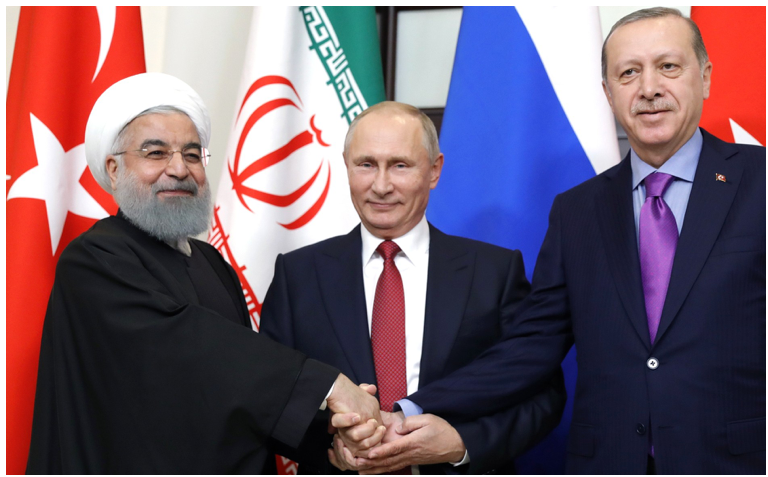 The convulsions in modern-day Turkey, and its relationship with Russia, are too complex and fast moving to include here, but we would all do well to watch closely. Other nations are mentioned . Sheba and Dedan	are Saudi Arabia and Kuwait - or - are associated with areas of northern Africa. Of foreign origin; Sheba, the name of three early progenitors of tribes and of an Ethiopian district: - Sheba, Sabeans. Of uncertain derivation; Dedan, the name of two Cushites and of their territory. The second form used in Eze_25:13: - Dedan. Probably the same as H8658 (as the region of the stone, or the reverse); Tarshish, a place on the Mediterranean, hence the epithet of a merchant vessel (as if for or from that port); also the name of a Persian and of an Israelite: - Tarshish, Tharshish. Commentators on Ezekiel says that, when the aggressors move against Israel, a few other nations ("Sheba and Dedan and the merchants of Tarshish") will remonstrate, as will "all her villages" - possibly colonies (Ezekiel 38:13). The objections to Magog's aggression will fall on deaf ears, however, and the invasion will continue. However, this is not the most obvious reading of the text, which records only a question; not a remonstration. But the idea of other nations raising an eyebrow but doing nothing to intervene sounds plausible. Ezekiel's account is clear - - no one comes to Israel's defence. This is probably equally true of the Armageddon war. By definition, that includes the United States and although American support for Israel has been strong it has become strained under the Obama administration and the political left. The real test, of course, will come when Russia and Iran and their allies begin to move forces toward Israel. How many Americans would be willing to risk nuclear war with Russia and Iran to protect even a loyal ally like Israel? Especially if Moscow and Tehran argue that they have no desire for a confrontation with the U.S. if they will just stay out of the way? Sadly, I suspect the number today is much lower than most supporters of Israel are willing to admit. Europe already shows itself extremely unlikely to defend Israel as anti-Semitism and anti-Israel attitudes and policies are becoming ever more widespread; along with rising Muslim influence. "Art thou come to take a spoil?" It is difficult to speculate on motives more than a thousand years in advance, but Ezekiel says that these nations come against Israel for financial reasons. But, as for the Armageddon war ...... A few years ago one might have asked what could there possibly be in Israel that would entice all those nations to invade Israel? But recently they have found 15,000,000,000 cubic feet of natural gas in Israel, plus oil. The signs are that Russia is watching the developments in Israel, and just waiting for their moment, with Iran and others, to invade Israel. Russia is using the Syrian civil war to assert itself as a Middle East player, in the power vacuum left by Obama's american policy. The way Ezekiel's war and Armageddon are described fix them as happening only after the rebirth of the State of Israel and the ingathering of the Jewish people from around the world and some other conditions mentioned earlier. While Islam has been covered at some length on wildolive, Russia has not. The following contains information from a programme by Glen Beck. Vladimir Putin is moving Russia towards regaining superpower status as a new dictatorship. Russia also has strategic ties to regional Islamic countries and is actively aiding Iran in building nuclear power plants that will giver Iran nuclear material for nuclear weapons. Russia's relationship with Islam is complex. Islamic minorities in Russia and the Former Soviet Union are a problem, but with the Arab/Islamic countries they have a common enemy in Israel. As relations between Russia and The USA decline, there is more of a common cause with Islam's hatred of "the great Satan" by many Islamic fanatics. What about the balance of power between Russia (ex soviet union) the United States? For many years we were looking at the Communists led by the Soviet Union as the threat to freedom and Christianity but now our attention has switched to Islam. But Russia is not out of the picture even though the Cold War has ended. Russia has a world agenda that wilfully arms Islamic fascism and rogue dictators to carry out warfare against the West. And, along with China, Russia is enabling Islamic fascism ain other nations confessing hatred toward the West. Vladimir Putin is gaining power all the time and he has specifically stated that his primary goal is to return Russia to world superpower status. If we assume that it will take Russia about 10 to 15 years to accomplish the re-establishment of a first class military, it probably is no coincidence that the same amount of time is needed for the Arab/Islamic block to become a real nuclear military threat to Israel. Consider Russia's deep historical roots and notice how Putin is following in the footsteps of Ivan the Great and others who have successfully used nationalism to unite Russians and in turn increase power and control in their region. Vladimir Putin understands Russia's past and is tapping into something deeply ingrained in the Russian people's DNA, and that is the Russian Orthodox Church. When Putin came to power in 2000, he inherited a crippled economy and a nation that lacked direction. In the first eight years of his reign, the Russian GDP grew by over 70%. Individual Russian wages tripled. This made him very popular, but there was something missing, influence. They were no longer the Soviet Union. Putin had been so laser focused on the economy for so many years, that attention to politics and posturing on the international stage had been an afterthought. Russia faded into the background and eventually off the international stage. NATO and EU influence advanced further eastward. The United States and Western Europe practically ignored Russia on the world stage. Putin has a geopolitical and a foreign policy that would return Russia and the Russian empire to its previous glory. What's very interesting to note here is that for the first time in 2,500 years, Russia and Iran are now working together, with all the nuclear know-how of Russia being used to create a nuclear Iran. You will also take note that when any nation attempts to sanction Iran for all the tricks they pull it is always Russia, and China, that side with Iran against everyone else. You will also note that the vast majority of the nations in Ezekiel's list have one glaring thing in common - they are all Muslim nations. Militant Islam has two goals in our day and age. The first is that of spreading Islam and Sharia to every country in the world. The second is the complete and total destruction of the Jewish people. For a long time, Russia was not interested in getting involved with Israel. But now Israel has Oil and Gas, these could be the spoils that Ezekiel's prophecy speaks of. Gomer (part of modern-day Turkey) and House of Togarmah (another portion of modern-day Turkey or possibly Syria) feature in the Ezekiel War story. Ezekiel 38:6 Gomer with all its troops; the house of Togarmah in the far reaches of the north, with all its troops â€” many peoples are with you. Turkey rather faded out of the Middle East with the defeat and breaking up of the Ottoman Empire in World War 1. But now President Erdogan is rolling back the efforts of Attaturk to make Turkey into a modern, secular democracy, and is seeking to become ruler of a big regional player among Islamic powers. In a similar way to Putin in Russia, Erdogan is working to become sultan of a revived Turkish Empire. This involves seeking leadership of Islamic nations in genocidal opposition to Israel. Turkey has had a variable relationship with Israel. Turkey appeared willing to make trade deals for water and gas, but has been involved in michaief making against Israel, supporting the Gaza flotillas etc. Turkey has been tinkering with the conflict in Syria. While attempting to export all the refugees streaming their way onwards into Europe, Turkey was making it easy for European jihadists to get to join Islamic State / Da'esh. Although the Turkish objective is not the same as the Russian objective they appear to have common cause against Israel and the USA. As a member of the North Atlantic Treaty Organization (NATO), Turkey is technically a US ally, but recent developments in Syria have made a US-Turkish confrontation seem more likely. Iran was Persia until quite recently and thus slots straight into Ezekiel's prophecy. Iran, like Turkey has its own agenda for foreign policy that draws it into an alliance in spite of differences. Iran, like Turkey, also seeks prominence in the Islamic world, but while Turkey is Sunni, Iran is Shia. They appear willing to shelve this difference for now while their mutual hatred is less than their hatred for Israel. A forthcoming (2018) meeting should be ringing alarm bells for prophecy watchers. There will be so many dead bodies strewn in the valley * that the Israelis must bury them in order for anyone to pass through. The Russian Federation has one of the largest military forces in the world and so if Gog or Magog is Russia and the Chinese joined together, it would not be surprising that dead bodies will block access through the valley because there will be millions upon millions of casualties with bodies piled upon bodies. * The travellers' valley, east of the sea, appears to be accepted as east of the Dead Sea. and so called because it was the great road by which the merchants and traders from Syria and other Eastern countries went to Egypt. It appears to be in ancient Moab , modern Jordan, God's final, greater Israel. It is interesting to note burial without weapons (no military honours) and Israel having to dispose of the weapons. Consider how this Ezekiel account parallels Zechariah's account in chapters 12 and 14 and Joel's " I will gather all nations and bring them down to the Valley of Y'hoshafat........."